NBA legend Charles Barkley defended police this week in an interview with CNN, as the firestorm continued over the decision by a grand jury not to indict officer Darren Wilson in the death of Michael Brown in Ferguson, Mo. In the interview, Barkley repeatedly came back to one point: He doesn’t believe that white cops are out to shoot black people because of racism. Barkley called for dialogue, and not just after a controversial incident like the Michael Brown shooting. “We never discuss race in this country until something bad happens,” he said. 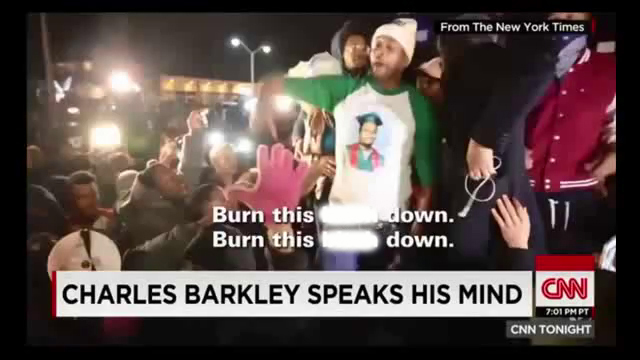 Barkley also criticized the rioters who set buildings and police cars on fire in Ferguson. They were set on destruction, no matter the grand jury’s decision, he believes. Charles Barkley is a retired American professional basketball player and current analyst on the television program Inside the NBA. During his career, Barkley established himself as one of the NBA’s most dominating power forwards. He was drafted by the Philadelphia 76ers with the 5th pick of the 1984 NBA Draft. He earned eleven NBA All-Star Game appearances and was named the All-Star MVP in 1991. In 1993, he was voted the league’s Most Valuable Player and during the NBA’s 50th anniversary, named one of the 50 Greatest Players in NBA History.